The “war on women” is a phrase ill-informed liberals came up with that — in reality — only applies to women that agree with their illogical viewpoints. However, if you’re a woman that doesn’t fall for their brainwashing tactics, you are not safe from receiving liberals wrath. They want equality for women — just not all women. Siekiewicz, who is known for his art work with Marvel, DC Comics and the New Yorker, had a response for that very question in his Facebook post. Oh, and if you're going to be this public about wanting to punch someone in the face, at least spell their name correctly. Here, let me help. 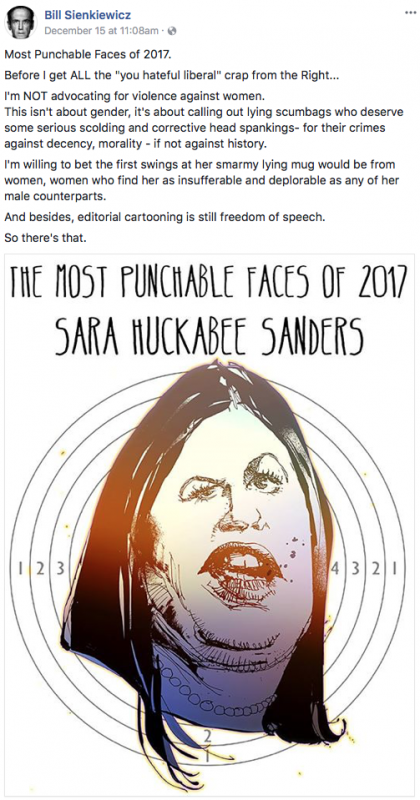 S-A-R-A-H.
It’s pretty hilarious to note that while Siekiewicz says he’s “NOT” advocating for violence against women in one sentence, he advocates for punching Sanders in the next sentence. Siekiewicz also said that he’s “willing to bet” that women would most likely be the first in line to punch Sanders squarely in the face. Why target Huckabee Sanders? She is merely an employee of the president who does the thankless job of putting forth Trump's views on issues to a media that -- for the most part -- despises her simply for working for Trump. The thing is, Siekiewicz decided to put all of these “punchable” people on a target board in his crosshairs, and liberals won’t think twice about that type of image. Wait a minute. 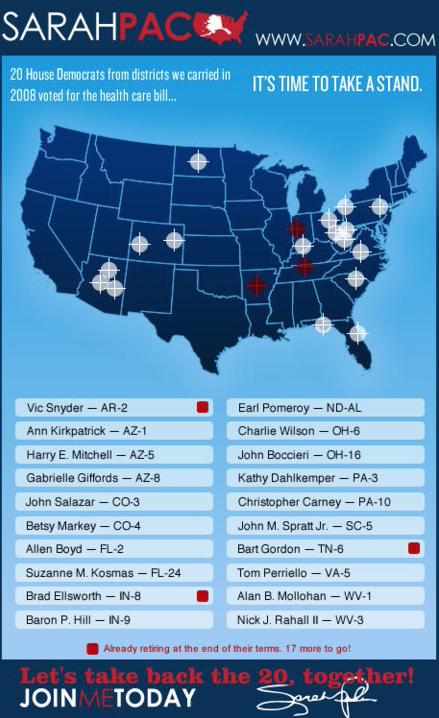 How could they make that leap considering there were 19 other politicians in that graphic who — by the way — weren’t the victim of a shooting? The Washington Post debunked the New York Times editorial board’s old claim that the Palin PAC graphic had an connection to the shooting. The New York Times themselves debunked the claim back in June of this year. It only took six years to print a retraction, but it’s a wonder that they did it at all. The answer to the second question would probably be a shorter list.